Heavy duty 6061 T6 Aluminum. Clamps to barrel with two 4140 Steel clamps. Fits GI spec Rifle barrels. Includes mounting clamps, screws, wrench and instructions. 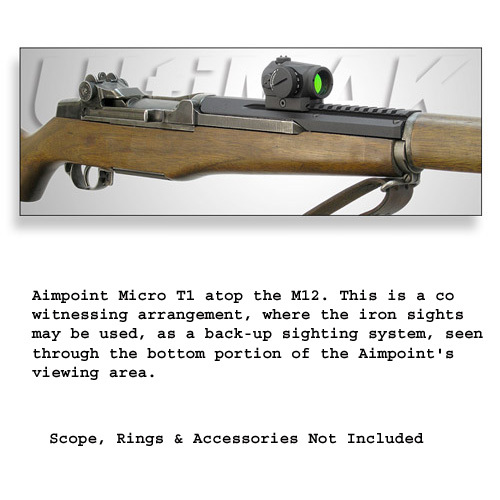 Elegant and simple, it's low enough to allow co witnessing of iron sights when used with tubular 1x optics such as Aimpoint, it is stable so you don't have to worry about loss of zero, it's rugged, it looks great as it blends in with the rifle's original profile, and it is designed to be installed by the user with simple tools. In a word, it's UltiMAK. Note regarding M1 "tankers" / Note to gunsmiths; Tankers (shortened M1 Garand rifles) are often a problem. 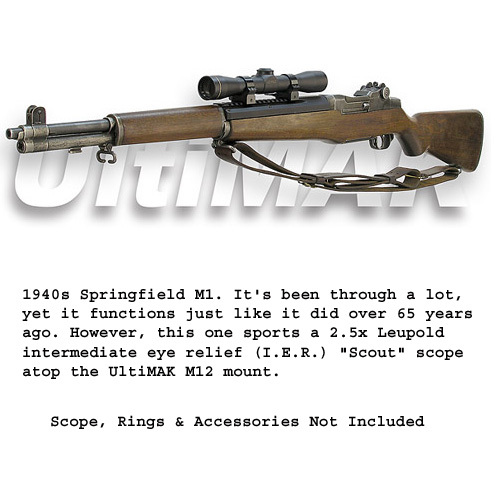 You need clearance of at least 0.050” between the barrel and the operating rod to accommodate the UltiMAK M12 barrel clamp, immediately behind the barrel band/forend cap, and most tankers do not have enough room there. You can see the forward clamp position, indicated by the screw, in the photo above. 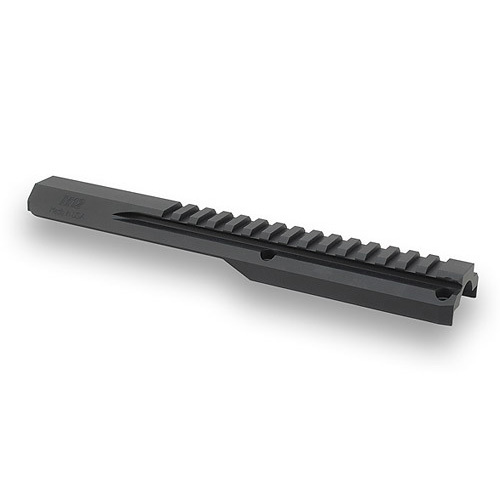 The forward clamp doubles as a recoil lug for the optic mount, extending just forward of the mount proper and buttressing against the barrel band/forend cap which is securely pinned to the barrel. The clamp is already as thin as practical, so trying to thin the clamp to make room is a bad idea. Ideally, the tanker conversion would be done with the UltiMAK mount in mind, and in that case it would be fairly easy to accommodate it. Please make note of this when planning any future tanker conversions.